We are recognized as one of the eminent Fabricated Industrial Fiberglass Sheet Manufacturers in India. The use of optimum quality materials in the manufacturing of the fiberglass industries ensures high durability, tensile strength and resistivity to adverse conditions. We are engaged in offering a wide range of fiber glass products. 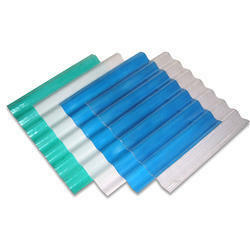 Among these we offer Fibreglass Sheet. These are made up of high quality fabric and are highly demanded. These sheets are available in different specifications and sizes, as per the diverse requirements of clients. In electrical industries Fibreglass (FRP) sheet are largely been used for different applications, mainly as insulation barriers, Drive links, supports etc. Having good electrical insulating values, toughness, strength, light weight the component is appreciated and being used by the industry. 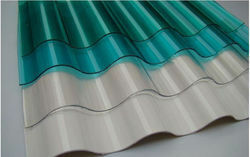 We offer FRP and Fibreglass Sheets that are available in different colors as per the requirement of customers. These sheets provide optimum sunlight during the day owing to their semi- transparent quality. Our sheets are used to make base of ventilators and also provide attractive and aesthetic look to all types of buildings. All sheets are manufactured using semi-autonomic press to ensure good surface finish and uniformity in thickness.These have dielectric strength of 25Kv/mm. Water absorption capacity of 0.2%.Tensile strength of 1220 kg/cm2.Compressive strength of 1940 kg/cm2.Standard sizes are available on demand. Frp/ fiberglass colured and natural roof lighting sheets. We are one of the leading Trader and Suppliers of Silicone Rubber Coated Fiber Glass Sheet, which can be availed by our customers in various color combinations. These cloths & Rubber are highly demanded in the market because of features like flexibility and smooth & glossy finish on both sides of the fabrics. We are a unique name in the market to provide our respected customers an exclusive range of Fiberglass Profile Sheet.